I'm a woman of little time and little energy, with little use for fussy furniture, but a big imagination; so, naturally, Ikea is my best friend. Hand me an Ikea catalogue, and I can spend the entire day planning out an entire room full of repurposed creations, some of which could be copies of far more expensive furniture seen elsewhere. For Christmas my partner and I received an Ikea voucher (yes, we love Swedish furniture so much that it has become a running joke between friends and family), and we decided to use it to purchase a kitchen island. 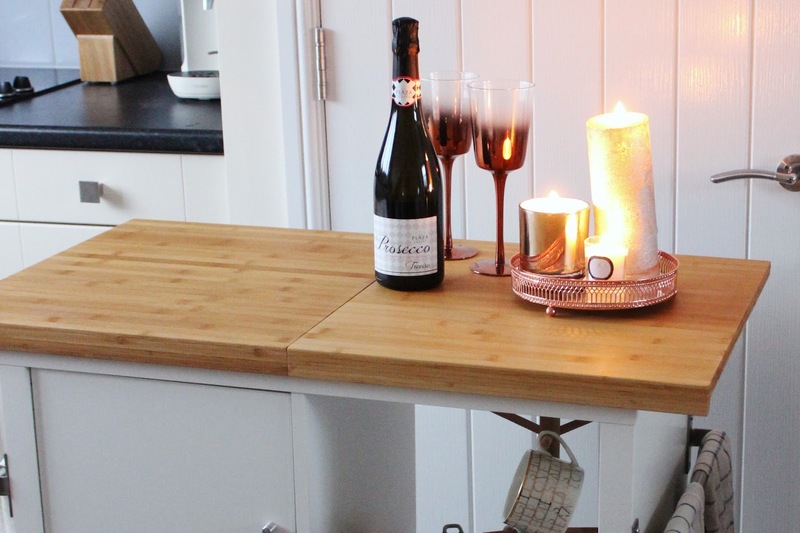 As we've only got a small kitchen, storage and counter space is like gold dust - therefore a kitchen island would make our lives so much easier. 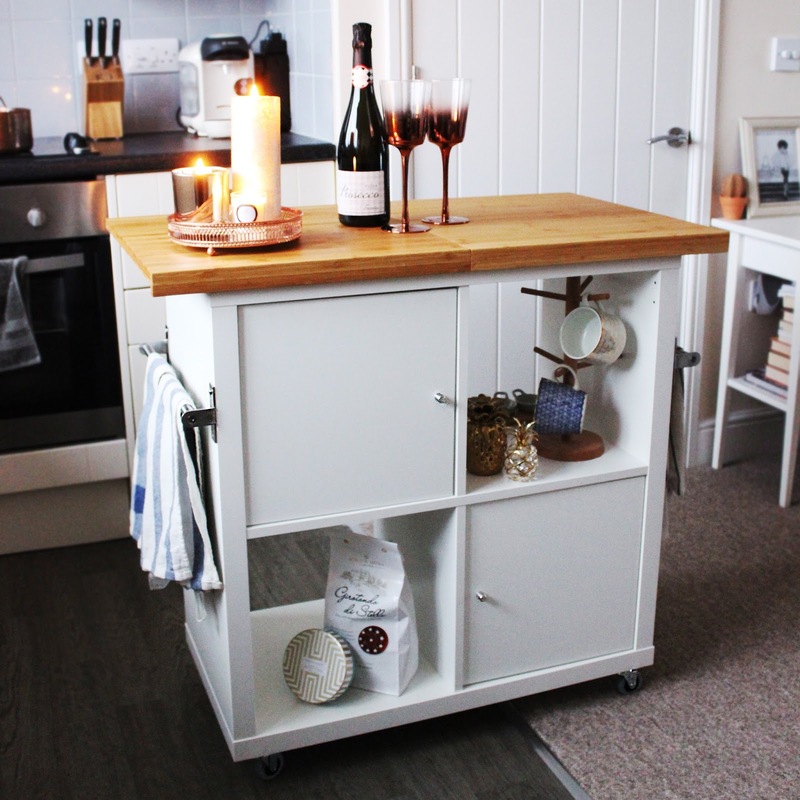 After browsing the website, I found a few islands and kitchen trolleys that I liked the look of; however, they were over our budget, so I decided to get creative. 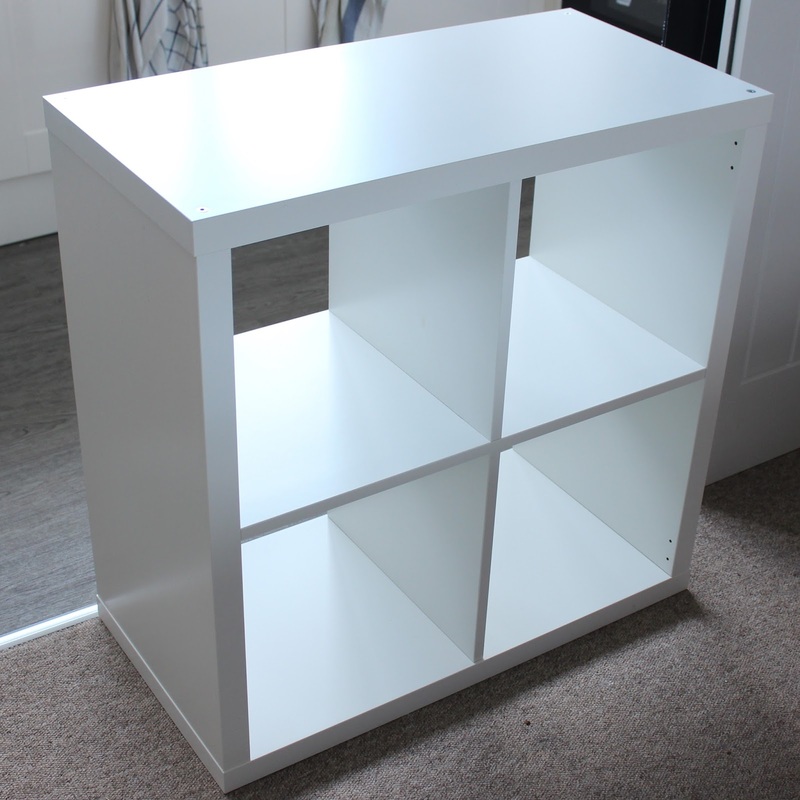 I saw the Kallax, a simple, square shelving unit which had oodles of potential, and decided that this would be our starting point. We began by putting together the Kallax. Easy enough. Then, we attached the castors to the bottom of the unit. 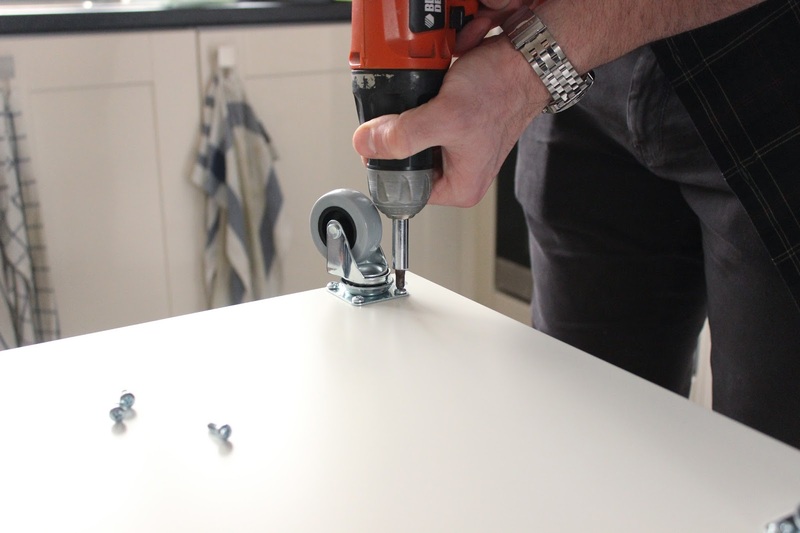 Screws are not supplied with the castors, so make sure you purchase some before you start (they need to fit a 4mm hole, and you'll need 16 of them). Luckily, we had some in our tool kit. We then turned the unit on its side to attach the Grundtal rails. These also need extra screws, and the fixtures overhang the unit by a few millimeters - so make sure you get the measurements right. After that, we put together the door inserts that would fit in the squares of the Kallax to act as cupboards. We wanted two inserts, so that we could use the other two square spaces as display shelves. Helpful tip: make sure you line the inserts up correctly, as you don't want them poking out the back of the Kallax unit and making it look un-neat. Next were the chopping boards. As we wanted to use these as the surface for our kitchen island, they needed to be oiled to protect the wood and prevent against the build-up of bacteria. 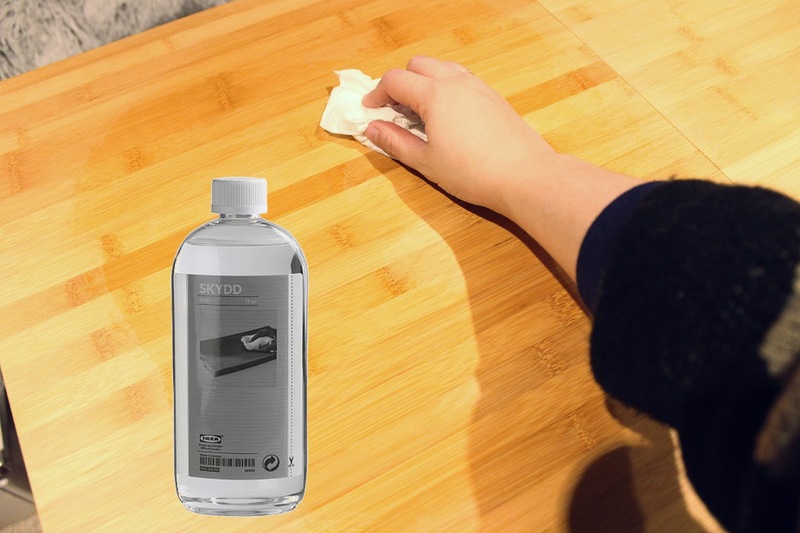 The Skydd wood oil is perfect for this, as it's a natural mineral oil which doesn't contain harmful chemicals. A bottle will last you forever, as you only really need around a tablespoonful per board, and it only needs to be topped up every couple of months. I flipped the boards over and attached them to the top of the Kallax using large-size Command Strips so that the island can be easily repurposed if needed, but you can use wood glue if you have it to hand. This took around four hours to complete - and we're so in love with it. 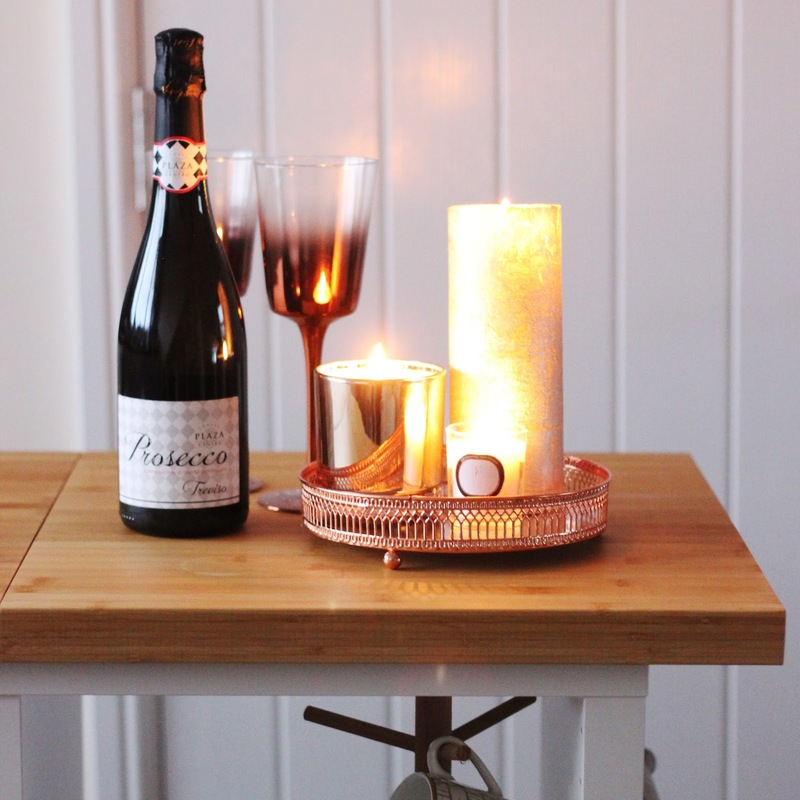 It fits our specifications exactly, and was incredibly affordable (so much so, that we were able to get a few extra pieces of home decor with our voucher!). However, I have to say that the best thing about this piece of furniture is that we put it together ourselves and made it our own. What do you think of our creation? 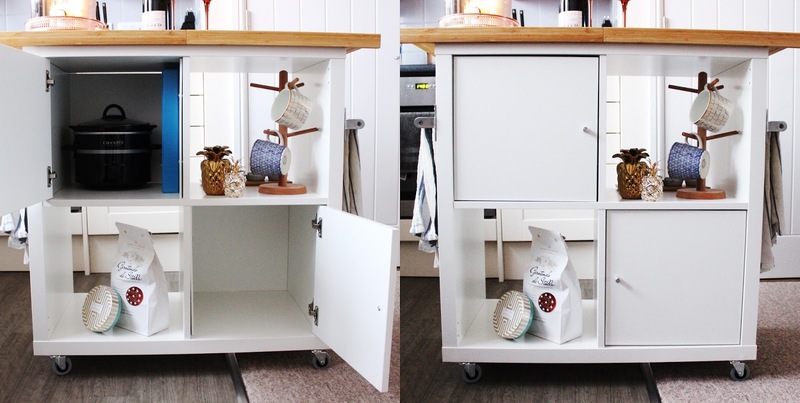 Have you repurposed any Ikea furniture? Let me know in the comments section below! If you want to see more of my posts, subscribe to my blog for FREE on Bloglovin' here. Or, follow me on YouTube and Instagram! Our command strips won't stick? Any tips? Very creative! Turn the chopping boards by ninety degrees and you will have nice 'handles' on both sides to pull it. that's a great suggestion Dan! This is great! I've thought of doing something like this but wasn't sure it would be tall enough. Is it about normal counter height? What are the dimensions of the finished product, mainly height. Could you fit a bar stool under the "counter" if it stuck out far enough? A friend had gifted me her Kallax shelf and I was at a loss of what I was going to do with it, so I was super excited when I came upon you hack, because I was also in need of some additional counter-space. I tried this hack, thank you so much for all the details and necessary pieces. -I needed to cut the boards to fit into the empty spot in my kitchen. I DO NOT recommend cutting the Lamplig boards to fit. They are made of bamboo and the saw just chewed up the boards and caused a great deal of splintering. I ended up sanding down the rough edges and they seem better now but just finished the project so I am not sure how my mistake will endure but I wanted to share this warning. I am so happy i came across your diy. I have very limited storage and counter space and this will make a great kitchen island for my small appliances. Taking my first trip to IKEA, can't wait. This is a great idea! And looks fairly simple too! Thanks for the post! Hi. I’m moving to a 490 sq.ft. apartment with a pretty small combined living room/ kitchen. Very little counter space and storage. So, I thought an island with an eating area would work. But, damn they are expensive! Your solution is much cheaper, and a bit smaller... both important. Here are my modification thoughts. Kallax coasters bring it up to counter height. Close in back with bead board or something similar. Attach the Norberg table to the back for eating, working, etc. Totally agree they're so expensive! These sound like really cool modifications and I'd love to see them executed - let me know if you do anything similar. Thanks for commenting! Where did you get the doors?